Cecil Foster is one of Canada’s leading public intellectuals on issues of race, culture, citizenship, and immigration. Dr. Foster divides his time between research, writing, and teaching, and he is a professor of sociology at the University of Guelph. For this month’s featured Oral History, he joins Paul Watkins, PhD student in English Literature, ICASP Graduate Fellow, and Toronto-based sound poet, for an informal public interview (during the 2011 Guelph Jazz Festival Colloquium) about jazz, improvisation, the writing process, and multiculturalism. You will also find an article here by Paul Watkins that riffs upon many of the theoretical discussions raised in the interview. In the article, “The Sound of Freedom: Fragmentation, Improvised Beings, and Canadian Multiculturalism,” improvised music and identity are looked at in relation to the movement of multiculturalism in Canada. Click here, to have a look at this month's Oral History. PhD student David Lee has written several books of non-fiction, and now his first novel is being published by Tightrope Books. 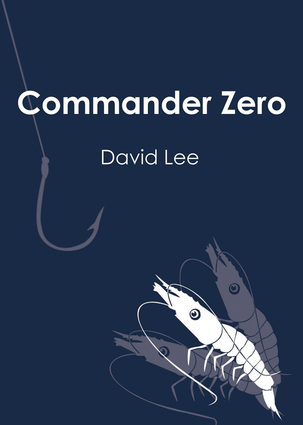 Commander Zero is being launched in Toronto on Wednesday, June 20 at the Revival Bar, 783 College Street (at Shaw). David will be reading, along with fellow Tightrope authors Samantha Bernstein and Royston Tester, books will be on sale, and admission is free. Since 2009 the artist collective Medea Electronique has organized an annual 10-day experimental artist residency, Koumaria, near Sparta in Greece, focusing on improvisation and new media practices. Avant-garde artists from all over the world, inspired by the Greek natural landscape, come together to create a multicultural and cross-media ‘dialogue’ culminating in a collective presentation in Athens at the end of the residency. Past residents have formed lasting friendships and new artistic partnerships. For us the residency serves as a model for future creative collaborations. The residency is held at an organic olive oil farm at the foot of Mount Taigetos in Sparta. Please see Open Call for full application details. This conviction that direct deed is the most meaningful reflection, I believe, has prompted the evolution of the extremely severe and unique disciplines of the jazz or improvising musician. Group improvisation is a further challenge. Aside from the weighty technical problem of collective coherent thinking, there is the very human, even social need for sympathy from all members to bend for the common result. As the painter needs his framework of parchment, the improvising musical group needs its framework in time. -Bill Evans, from the liner notes to the seminal Miles Davis album, Kind of Blue. 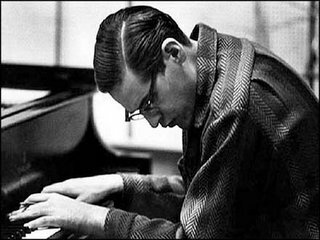 Bill Evans was the pianist in Miles Davis's group in 1958, but after recording several tracks and touring with the band for less than a year, he left to form his own trio and expand his career. He was called back to play on the now-legendary album Kind of Blue in the spring of 1959. 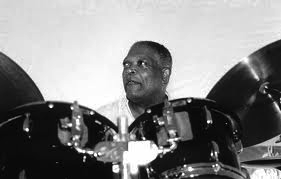 According to many sources, Miles's modally-conceived tunes in these sessions were indeed based on the playing of Evans. Evans, in fact, penned "Blue In Green" (though the writer's credit still often goes to Davis). A dusk ‘til dawn community spectacle of Outstallations, Inspirations, and Improvisation. Held from sunset Saturday, Sept. 8th to sunrise Sunday, Sept. 9th. We are interested in injecting as many creative projects into the night as possible to complement the Guelph Jazz Festival and Nuit Blanche musical programming. If you are an artist interested in participating in Guelph's third annual Nuit Blanche, we encourage you to find a venue, create a piece and apply. Please visit the call for submissions for full details. “It might be..useful, perhaps, to think of him as a folk musician who makes miniatures of the world around him using scraps torn from corners of the map." 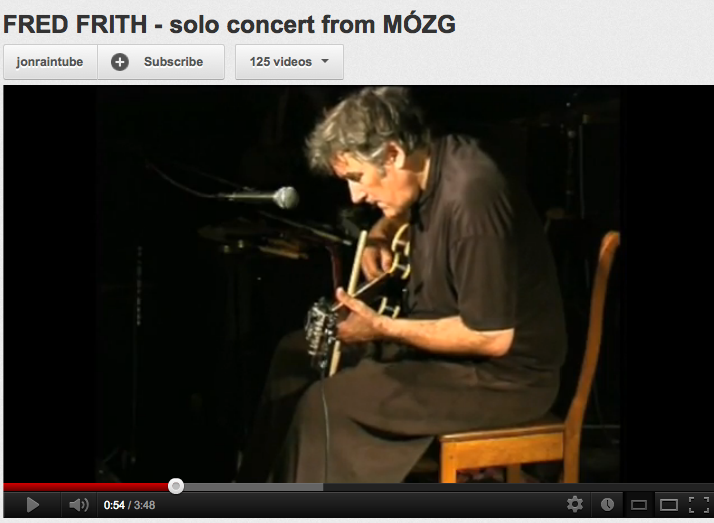 Fred Frith is a world-renowned performer, composer, improviser and teacher. 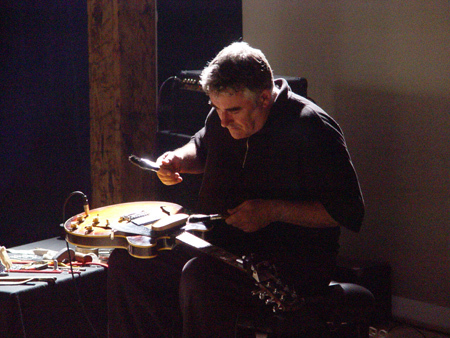 Having performed in a number of well-known and cult ensembles, guitarist, composer, and improviser Fred Frith is currently a professor of music at Mills College and collaborates frequently with the crème-de-la-crème of the international music stage. Though the point of reference for many remains the iconic band Henry Cow, which he co-founded in 1968 and which broke up more than 30 years ago, Fred Frith has never really stood still for long. 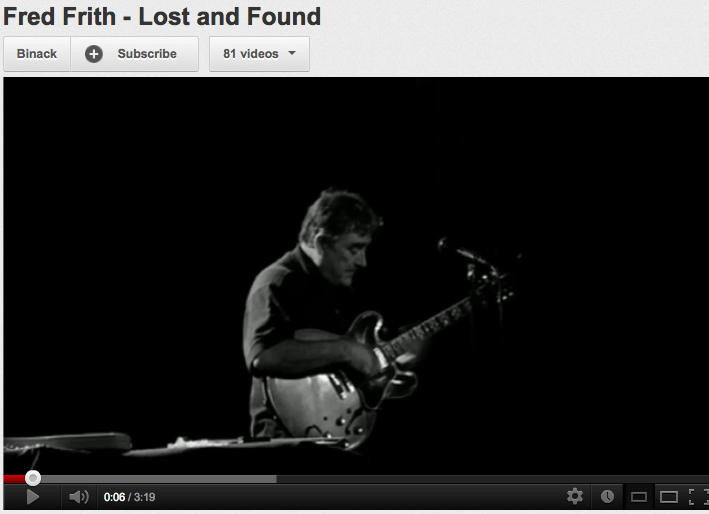 In bands such as Art Bears, Massacre, Skeleton Crew, Keep the Dog, Tense Serenity, the Fred Frith Guitar Quartet, Eye to Ear, and most recently Cosa Brava, he has always held true to his roots in rock and folk music, while exploring influences that range from the literary works of Eduardo Galeano to the art installations of Cornelia Parker. 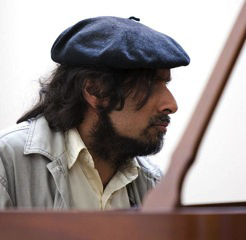 He has collaborated with musicians as diverse as Derek Bailey, John Zorn, Bob Ostertag, Mike Patton, and has produced albums for other musicians, including: Curlew, The Muffines, and Orthotonics. Frith is also the subject of Nicolas Humbert and Werner Penzel’s award-winning 1990 documentary film Step Across the Border, and he appears in the Canadian documentary Act of God, which is about the metaphysical effects of being struck by lightning. In a typical solo improvising concert, Frith lays a couple of his homemade guitars flat on a table and plays them with a collection of found objects (which vary from concert to concert). He drop objects, like ball bearings, dried beans and rice, on the strings while stroking, scraping and hitting them with whatever is on hand. Later in the show he might add a live sampler to his on-stage equipment, which he controls with pedals. Frith is a testament to the possibilities of creative music and a source of inspiration to improvisers around the world. 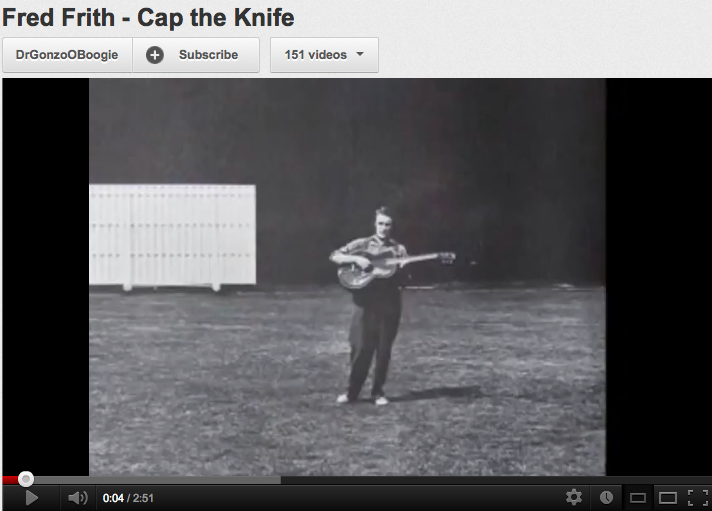 On May 3rd, 2012, Fred Frith joined ICASP students at McGill and Guelph (via Skype) to listen to student presentations about the changing place of musical improvisation in universities. 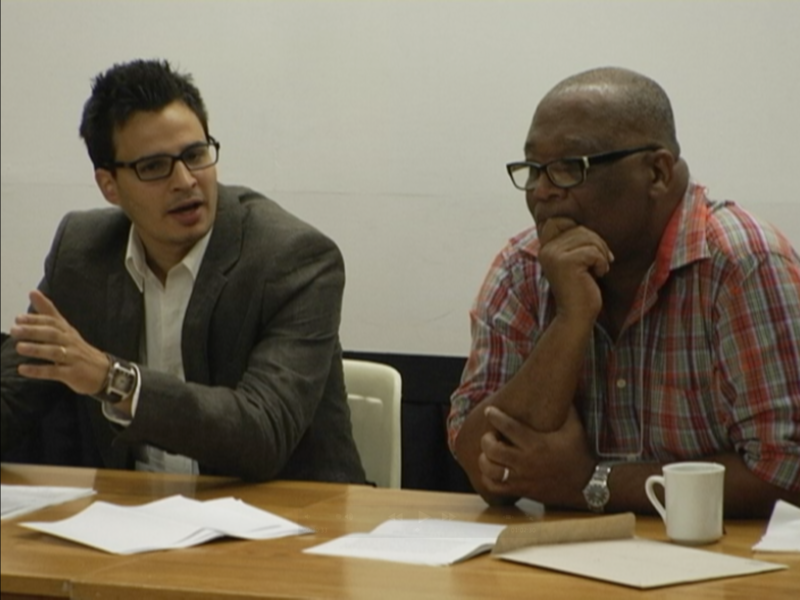 Frith provided critical feedback on each student presentation. The night before he also performed in Montreal, accompanied by Charity Chan on piano and Jean Derome playing a variety of wind instruments (saxophones, clarinets and flute). Frith will be playing at this year’s Guelph Jazz Festival with the Rova Orkestrova. They will perform their work Electric Ascension, which is an electronic interpretation of Coltrane’s powerful watershed album, Ascension. All talks and panels are FREE and open to the public. Since 2007, the Improvisation, Community and Social Practice research initiative (ICASP) has hosted a yearly colloquium in Vancouver in collaboration with Coastal Jazz: Comin’ Out Swingin’ – Improvisation and Sexuality (2007), Power Play – Improvisation and Sport (2009), Sound Lines – Improvisation, Text and Media (2010), and Shift, Mix, Blur – Improvising Across Boundaries (2011). Featured speakers have included Matana Roberts, Sherrie Tucker, Marilyn Lerner, Paul Steinberg, François Houle, Barry Guy, Michel Gagné, Wayde Compton and Taylor Ho Bynum. 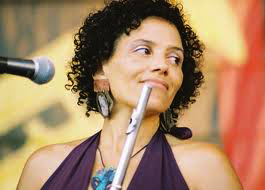 This year, ICASP and Coastal Jazz will host a colloquium on Jazz, Race and Politics on Saturday, June 23, 2012, at UBC Robson Square, during the free opening weekend of the Vancouver International Jazz Festival. Presenters will include Nicole Mitchell, Billy Hart, Billy Harper, and Ajay Heble. There will be a series of keynote presentations and panels, at which musicians, academics and community members will discuss the complex and compelling relationships between improvised music and its cultural and social contexts. How do concepts of racial or cultural background impact the performance and the history of jazz? Can improvisation offer a means of speaking truth to power? How do our perceptions and preconceptions of race, of ethnicity, of foreignness, or of multiculturalism affect the reception and the impact of this music? How might jazz educate its listeners about cultural difference?